FRINGE WORLD performance art piece FEMME may be the brainchild of seasoned burlesque performer Lola Cherry Cola, but the show is by no means a burlesque one (although we can expect some burlesque). 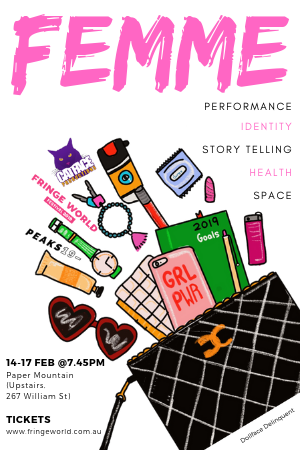 FEMME offers a platform for performers as well as non-performers including Cola to tell their honest and raw stories such as Cola’s difficult brush with abnormal pap smears, HPV and cervical cancer. Cola gives a platform for their voices and stories to be heard in her follow-up to previous Fringe show, Lola’s Showgirl Smear Campaign. CHERYL LIM talks to Cola about the need for these important stories to be told as she allows us to catch a glimpse behind the curtains. This year marks your 10th year as a burlesque performer – as Lola Cherry Cola. You have nearly retired from burlesque, but you are drawn back to the limelight for FRINGE WORLD in your latest offering. How does FEMME differ to previous burlesque shows that you have been a part of at other fringe festivals? My previous shows were more traditional burlesque shows and while I found the high calibre of performers I was working with exciting, it still felt like I wasn’t pushing myself creatively as much as I should have been. After going through a health roller coaster (which lead to the creation of my last show, Lola’s Showgirl Smear Campaign), I found what was missing in my burlesque before – a message. FEMME was born out of this desire, not just to tell my story, but to build a platform for others to tell theirs too, in whatever manner they felt comfortable with. You have some personal experiences surrounding abnormal pap smears, HPV and cervical cancer. How did yours and others’ stories spark your passion for women’s health advocacy and give rise to FEMME? Lola’s Showgirl Smear Campaign was a labour of love and grief. It was a HARD show to create, sell and present. It felt like I was forcing a show onto a world that wasn’t quite ready for it. I’m still insanely proud of myself for that show, but what kept bugging me was that there was so much more that needed to be said and heard. Smear Campaign was too narrow and only one voice – but what I loved about it was the conversations it sparked. In the wake of posting about my health scares, and then the show, I was really humbled by the women who reached out to me, who had gone through similar things and been too afraid or ashamed to speak about them. I wasn’t entirely sure what to do with this, so it percolated in the back of my brain for a while until the idea hit me – create a forum so that these stories and experiences can be told, with the goal of inspiring others to find their own voice. FEMME aims to give a voice to areas of women’s health that have been kept in silence because of the shame associated with these stories. Brene Brown says that, “if you put shame in a petri dish, it needs three things to grow exponentially: secrecy, silence and judgment. If you put the same amount of shame in a petri dish and douse it with empathy, it can’t survive.” Have you found this to be true and does FEMME aim to shine a light on taboo topics so that we can create a space where empathy can enter and remove the shame? Totally! We suffer too much because of shame, and often don’t seek the help we need because of it. We’re all human, we all go through awful things, and we shouldn’t miss out on care because we’re paralysed by what other people would think of us – or worse, what we think other people would think of us. I was recently listening to a podcast about a researcher that had been studying google search term data. After “depression”, “herpes” is the most common medical condition googled before googling “suicide”. That just hit me like a kick to the guts. It seems extreme but until you have a diagnosis that makes you feel isolated and worthless, you don’t understand how destructive shame can be. It is really hard to shed the mental stigma that builds up over a lifetime, but nothing will make me happier than if FEMME can help someone in any way. What kind of challenges have you faced as a burlesque performer in Australia that come from judgements, prejudices or a lack of understanding for those in this industry? How have these challenges brought about your passion and made you a champion for women’s health advocacy? The prejudices are even rife in the industry itself. Some performers get offended if they’re called “strippers”, so I guess without realising it, I have spent the last 10 years pushing back against stigma by identifying openly as a stripper. Never shame or underestimate a stripper. Anything you can do, we can do bleeding, and wearing six inch heels! Behind each Instagram photo or onstage fantasy is countless hours of hard work. Most of us are own managers, marketers, promotors, accountants, negotiators, sales, makeup artists, hair stylists, choreographers and costumers. When you are a one person army, you need to take care of yourself. It is far too easy to fall into the trap of thinking that being busy is the same as being successful and running yourself into the ground. Without your health, the business empire you have worked so hard to build grinds to a halt. At the end of days, cockroaches, Cher and strippers will inherit the earth. There must be some amazing individuals hitting the stage with you on this journey, who are some of the performers who will be sharing the limelight? The line up of FEMME is revolving over our four night season so I could give a stage to as many voices as possible. We are so lucky to have the 2019 FRINGE WORLD Circus Weekly Award winners Yuck Circus joining us off the back of their sold out and critically acclaimed debut show as well as 2018 FRINGE WORLD Best Comedy and Best Cabaret nominee Jamie Mykaela who is known for her feminist ukulele-wielding brand of cabaret. Melbourne Fringe 2018 Best Comedy nominated Bella Green (check out her show Bella Green is Charging For It) will be joined by local comedian Charlotte Glance and burlesque veteran and pin-up sweetheart Iskra Khan will be teasing us with her funning bone. Camden Champagne will be stepping away from the feather and silk fans she is known for and instead presenting a spoken word piece. FEMME has two burlesque performances from Dollar Dazzler and Chelsea Smiles who will be performing emotive burlesque pieces on two very different but incredibly relatable topics. 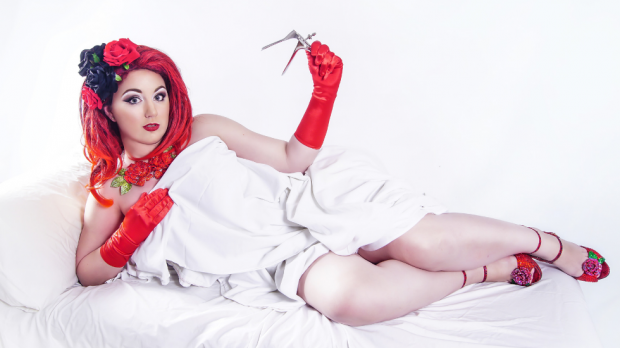 FEMME is a follow-up show to your earlier FRINGE WORLD show, Lola’s Showgirl Smear Campaign and it is described as a fusion of intimate storytelling and performance art. As this is not a burlesque show, as some may mistakenly think, but performance art, what can audiences expect if they attend one of your shows from February 14-17 at The Common Room in Paper Mountain? As much as I want to be able to tell you exactly what to expect from FEMME, the truth is I don’t even know what to expect! I want you to be entertained, think and feel. I hope that you see a little of yourself in the performers and their stories, and maybe realise something more in you. When I say these are our stories, I mean that both in the singular and also the collective. These stories could be your mother’s, your daughter’s, your sister’s… they could be yours. I think the more we can understand each other, and listen to each other’s stories, the better we’re going to be as people. In no way do I think this show would or could change the world, but if one person walks out of it with less shame, or more understanding, then it’s all worth it.